The College of Business announced a milestone gift Feb. 9 of $2 million from alumnus Clint Severson and Conni Ahart. The largest gift in Minot State University’s history, it will endow the entrepreneurship program. Severson is chairman of the board and chief executive officer of Abaxis, a medical devices company based in northern California. He is the 2007 Forbes Entrepreneur of the Year and a 1973 MSU graduate. The Severson Entrepreneurship Academy engages students from multiple disciplines, not just business fields. Students from non-business fields like history, broadcasting and art bring their skills and viewpoints to projects and students and the community benefit. MSU will apply for a $1 million matching grant from the North Dakota Higher Education Challenge Grant Program. 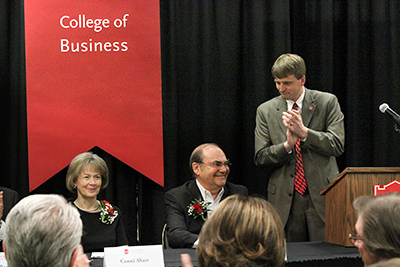 To read the full news release, visit http://www.minotstateu.edu/pio/news/2016/02/largest-gift-in-minot-state-history-will-support-severson-entrepreneurship-academy.shtml. College of Business students who major in management information systems will learn the latest about network security from industry leader North River IT Thursday (Feb. 18) in Old Main 308 from 8:30 to 9:15 a.m. The Severson Entrepreneurship Academy sponsors the event. “Opportunities such as this connect our management information systems students with the industry by allowing them to build their professional networks and enabling them to advance the knowledge gained from the classroom,” said Kristi Berg, business information technology associate professor. Chaz Hager, North River IT owner, will focus on perimeter and edge network security. Discussions will include firewall products and security solutions to detect, identify and mitigate threats many businesses don’t know exist. Hager will share his experiences with actual network security. He will explain how he helps clients with today’s ever-changing security needs. For questions, contact Berg at kristi.berg@minotstateu.edu. The Cyril Moore Science Center and the undergraduate student clubs, Beta Gamma Science Club, Club Biology and AUGITE, are hosting an open house Tuesday (Feb. 23) for students in grades 3-6 from 8:30 a.m. to 3 p.m. Minot State University faculty and students will demonstrate science activities throughout the center. They will also perform chemistry “magic shows” on each hour, starting at 9 a.m.
For the public, the Division of Science will host a chemistry magic show at 3 p.m. in Hoffman Auditorium. Faculty and students will perform experiments developed by MSU classes that include things parents warn their children to never do — play with dangerous chemicals, fire and explosions. The public chemistry magic show starts promptly at 3 p.m. and lasts 40 minutes. For more information, contact Guy Hanley, assistant professor of science, at guy.hanley@minotstateu.edu. Minot State University’s Program of Theatre Arts presents Melanie Marnich’s “These Shining Lives” in Aleshire Theater Feb. 24-27 at 7:30 p.m. Doors open 30 minutes prior to show time. Kevin Neuharth, theatre arts professor, directs this emotionally provocative social drama based on the real life story of four women employed by the Radium Dial Company in the 1920s. In an era when women were a novelty in the workplace, they were employed to meticulously paint glow-in-the-dark markers of time for watches and clocks. Their fine brushes, drawn to their lips, were then rolled to a fine point and dipped in the radium-based glow-in-the-dark paint over and over. With each new brush stroke, and each new point made with their lips, they were robbed of countless years of their lives, all the while reassured that radium was perfectly safe, even medically beneficial. Bethany Andreasen, history professor, will present “McFarland & Co.: Connections between Minot State and Valley City State” Feb. 25 in the Conference Center, 7 p.m. Andreasen’s lecture is part of the Northwest Art Center lecture series, but in a different location than previous presentations. Andreasen’s lecture will identify important individuals connected to both schools and examine the careers of some who played important roles in the Minot State’s development. To read the full news release, go to http://www.minotstateu.edu/pio/attachments/2016/Andreasen%20NAC.pdf. The lecture series continues March 1 with a special preview screening of “A Bold Peace” in Aleshire Theater at 7 p.m. The documentary, directed by Matthew Eddy, sociology assistant professor, is about Costa Rica disbanding its military more than 65 years ago and redirecting national resources toward public education and universal health care. Both lectures are free and open to the public and followed by informal receptions. For questions, contact nac@minotstateu.edu. On March 4, Minot State University’s Student North Dakota United chapter and North Dakota United-Retired will host a literacy event throughout the Minot Public School District. The event commemorates Dr. Seuss’ upcoming birthday and Read Across America. Minot State SNDU and NDU-Retired members will read books in classrooms and give a new book to every Minot Public student grades kindergarten through second grade. SNDU strives to provide opportunities for education majors to be involved in and lend services to the Minot education community. Standing officers include Megdalyn Kuske, president; Taylor Foley, vice president; Tiana Olson, secretary/treasurer; McKenna Hodenfield, public relations officer; and Nikki Egge, student government representative. Dan Conn and Joe Zajdel, both assistant professors of teacher education, are faculty sponsors. 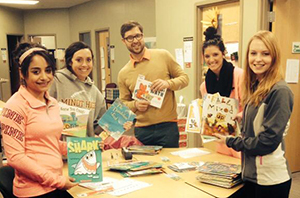 To read the full news release, go to http://www.minotstateu.edu/pio/news/2016/02/msus-sndu-chapter-hosts-dr.-seuss-literacy-event-in-minot-public-schools.shtml. Official spring 2016 enrollment figures at Minot State University are 3,180 students, representing a 4.2 percent decrease compared to spring 2015. Within the overall enrollment figures, the number of new transfer students and new graduate students declined, while the number of new freshmen, Minot Air Force Base students and international students increased slightly. Enrollment numbers become official after the fourth full week of classes, when they are reported to the North Dakota University System. Minot State University welcomes new employee, Susan Weston, as an accounting instructor in the College of Business. A certified public accountant, Weston graduated from MSU with a Bachelor of Science in accounting in 1985, and she was previously employed by the Mountrail County Health Center. She is also treasurer of the Scandinavian Heritage Association in Minot. On Jan. 25, the North Dakota University System Staff Senate elected Andy Wakeford as the staff advisor to the State Board of Higher Education. Wakeford, the online coordinator/online advisor at Lake Region State College, assumes his staff advisor role July 1. Wakeford is the third NDUS staff member to serve in this position, which was created with the passage of HB 1213 by the 2011 Legislative Assembly. He is a non-voting SBHE member and can be contacted at andy.wakeford@lrsc.edu. Feb. 17-19 — “Americas 2016: Paperworks,” a national juried exhibition with guest juror Karen Kunc of Lincoln, Neb., Hartnett Gallery. Feb. 17-March 1 — “Americas 2015: Paperworks” Best of Show, prints by Mark Sisson of Stillwater, Okla., Library Gallery. Feb. 29-March 31 — MSU Art Faculty’s Biennial Exhibit, Hartnett Gallery. A public opening reception for the MSU Art Faculty’s Biennial Exhibit with the artists will be Feb. 29 in Hartnett Gallery, 6:30-8 p.m.
Paul Cristofaro, Spanish assistant professor, presented “Getting Students Acquainted with Spanish Language through a Socio-Historical Perspective of Spain” Feb. 5 at the FLAND Winter Conference. Beth Odahlen, Center for Engaged Teaching and Learning director, was appointed the secretary for the National Society for Experiential Education board. Odahlen has been a NSEE member for six years and a board member for a year. She started her term as secretary in January. Walter Piehl, art professor, had a painting accepted into the Tucson Museum of Arts permanent collection in summer 2015. Piehl will give a presentation to the museum’s docents this month.